This past week, we had a very special storytime! 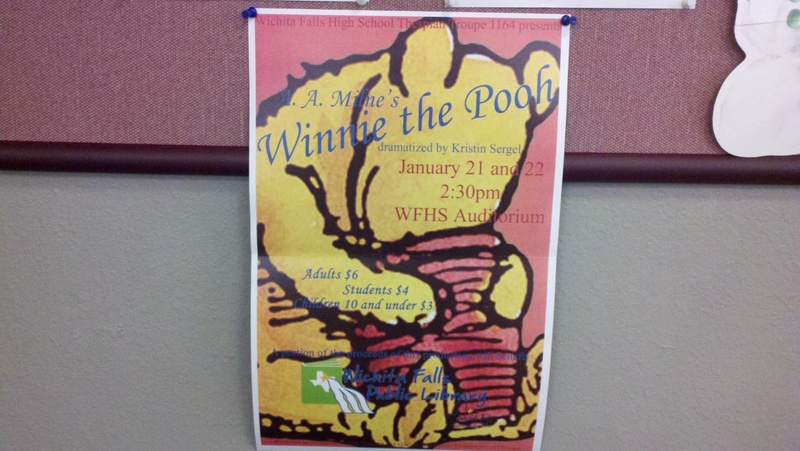 We invited the local high school drama group to come in and do a scene from their upcoming Winnie the Pooh play! There were about 20+ high schoolers who showed up in costume, and it was a great treat for the storytime kids! One little boy in my Tuesday session didn’t know quite where to look because even as the scene was going on, he had Kanga sitting right next to him and Owl just behind him and he wanted to take it all in. The High School kids were great with the storytime kids, giving out hugs and playing peek-a-boo with the toddlers. They did their scene right after our opening song, and then they had to leave so that they could get back to school before their next class. Since the Winnie the Pooh scene from the play was short and sweet, I had some Winnie the Pooh books and an activity planned for the rest of storytime. This activity is inspired by Miss Mary Liberry’s Bibbity Bobbity Boo, There’s a Teddy Bear on my Shoe post. 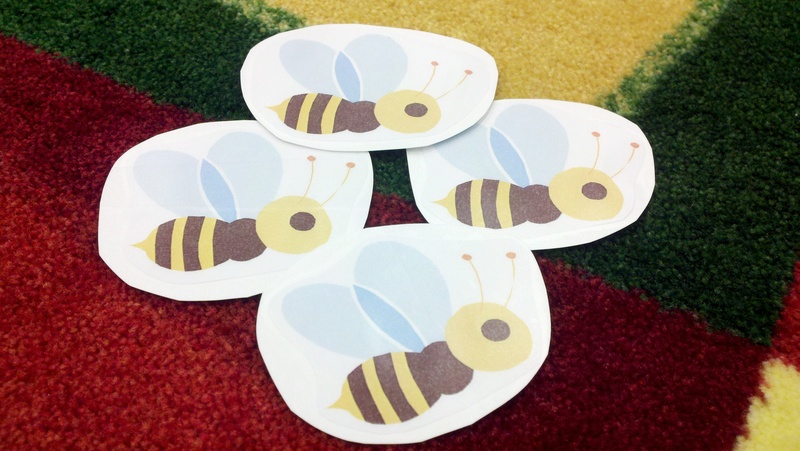 I made clip art cutouts of bees and handed them to the kids, then we said, “Bibbity Bobbity Bee, there’s a bee on my knee!” and so on and so forth with various body parts. The kids loved it, and the parents did too. A few mom’s took pictures while we were doing the activity (I’ve been noticing more and more picture taking lately), and several mothers asked for printouts of the bees after storytime so that they could do the activity at home with their kids! Success! Thank you, Mary! In this story, Tigger bounces up a tree, but then his fear of heights kicks in and he’s stuck. He promises to never bounce again if he could get down, and Rabbit holds him to his word when he finally does manage to get down. 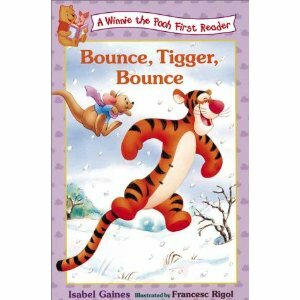 However, the prospect of never bouncing again makes him very sad, and Rabbit would rather have a bouncing, happy Tigger than a depressed one, so Tigger is allowed to bounce once again! After reading a story about bouncing, I couldn’t help myself but to have the kids practice bouncing. We did little bounces and big bounces. Fast bounces and slow bounces. And then we counted our bounces. This was a simple activity that the kids loved and, best of all, it required no prep-work on my part. This was a very cute story about how there’s always room for another friend. 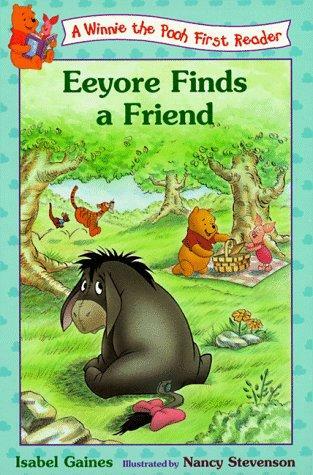 Eeyore goes looking for someone to spend Twosday with, but all of his friends are already paired off. 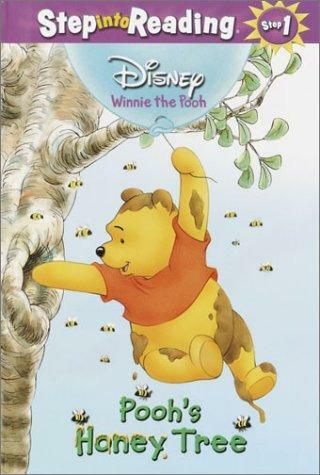 Pooh, however, says that it’s more fun with more friends and invites Eeyore to join him and Piglet. The adults got a chuckle out of the Twosday wordplay, but that went right over the kids’ heads. Yay! Glad y’all had fun! My kids liked it too. And THANKS to Tara who posted it originally on PUBYAC!